With the launch of Google Music, and iTunes upgrading its solution with a new feature called “Match“, the stream your music vs. buy each track debate rages on. It’s truly a personal preference, but some artists aren’t interested in having their music streamed just yet. Numbers out of Sweden might have them thinking otherwise though. According to a report from Swedes And The Internet (PDF), Spotify usage has surpassed that of instant messaging, blog reading, and playing games online in Spotify’s native country. Since Spotify has been available for some time in the country, it could be a tip-off to the type of usage we’ll see in the United States and other countries. Spotify allows you to pay a premium fee to stream all of the music you like, on any of your devices. The service is built to be social by nature, as it is only available to Facebook users. Tracks are shared on your wall and shown in the Facebook ticker, causing your listening habits to instantly go viral among your friends and family on the service. Just over half (57%) of the Swedish people listen and download music via the Internet. The percentage of file sharing (21%) have never been greater. But the proportion who listen to streaming music using Spotify is even greater. Amongst those aged 16 to 25 years, almost 9 out of 10 (85%) are on Spotify and half (55%) listen daily. The older people buy CDs and pay per song, while the younger subscribe, share files or listen to Spotify. One in three people (37%) listen to Spotify during a month, which is twice as many as file sharing (18%) and many more than those who buy a CD (9%) or pay per song (4%) during a month. In Sweden, Spotify usage is even running ahead of use of community sites, IM, blog reading and game playing. 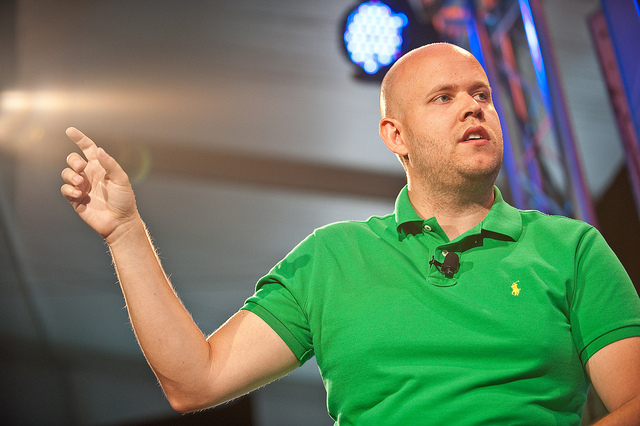 Spotify launched in Sweden back in 2008, so it had a three-year head-start on the United States. National music revenue grew by ten percent in Sweden at the end of 2009, showing that Spotify indeed has staying power and could be a good thing for artists and record labels. Will these trends show themselves in the U.S.? It’s too early to say, but traction on Facebook after the f8 partnership announcement has been massive. The Spotify app on Facebook has risen to the top, and surpasses all other music apps by far. The key for Spotify, I believe, is that it’s not just a music streaming service. It’s a platform that other developers can build apps on top of. That type of platform has never been witnessed on the Internet before, and could drive huge revenue for bands and labels if they just stick with the service and not turn on it. Apps need music, and musicians need distribution. It’s a match made in heaven. Do you prefer to buy or stream? Perhaps a mix of both? Personally, I prefer to stream all of my music, and if an album is good enough, I go ahead and purchase it. I also spend a lot of money on concert tickets, and that’s where artists make a huge chunk of their money. Maybe Spotify will start offering streams of live concerts, that’s something I’d pay extra for.